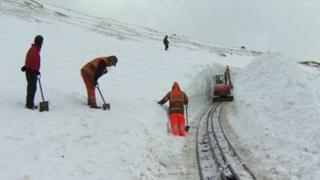 Snowdon Mountain Railway will be shut over the Easter weekend after it was hit by 30ft (9.1m) snow drifts. Workers using two excavators tried but failed to clear the 4.7 mile (7.5km) track. The railway resumed operations from Llanberis last week after the winter break but they were suspended within days after heavy snow on the mountain. Railway workers said they had experienced the worst weather conditions in more than a decade. Alan Kendall, general manager of Snowdon Mountain Railway, said: "It's the worst I've experienced in the 11 years I've been here. "We were looking forward to two good weeks at Easter but our first week has effectively been wiped out because of the weather. We're now working hard to try to get things turned round for the rest of the holiday period." Around 12 people attempted to clear the snow on Wednesday and Thursday. Mr Kendall added: "The snow is absolutely solid about half way up but we're using two rubber-wheeled excavators to help clear a way through." Although trains had travelled to the summit over the last four years during Easter, traditionally the service went only as far as Clogwyn when Easter fell in March. Meanwhile, walkers and climbers have been warned to be prepared for the conditions after six people were rescued over the last week. On Monday, six climbers were airlifted from the snow-covered peaks. An RAF rescue helicopter from Valley, Anglesey, winched three men from Northumberland from Snowdon's Pyg Track. One was taken to hospital in Bangor with a dislocated shoulder. In a second rescue above the Ogwen Valley, three people from Warwick had called for help in the snow and bitter wind. John Grisdale, chairman of the Llanberis Mountain Rescue Team, said: "There is an incredible pressure on our rescue teams at the moment. "It is difficult enough to rescue troubled walkers when the weather is pleasant but saving walkers in weather like this is difficult and time consuming and totally unnecessary." He said temperatures were dropping to -20C in places.